My friend Heather started blogging. We talked a few months ago about working together to write through our grief so I am thrilled to have her beside me in the blogging world as she is one of the most inspirational people I know. I am going to participate in the blog challenge with her and I'd love it if you would, too. I'm even looking at you, Jamie. I'm going to do the challenge on days when I have no topic materializing. Day 1: A recent picture and 15 interesting facts about yourself. 1. I'm obsessed with Abraham Lincoln. I've always loved him, but several years ago we used his birthday as an celebratory excuse to go out for dinner with my in-laws. We had such a ridiculously fun time that we made this an annual event. 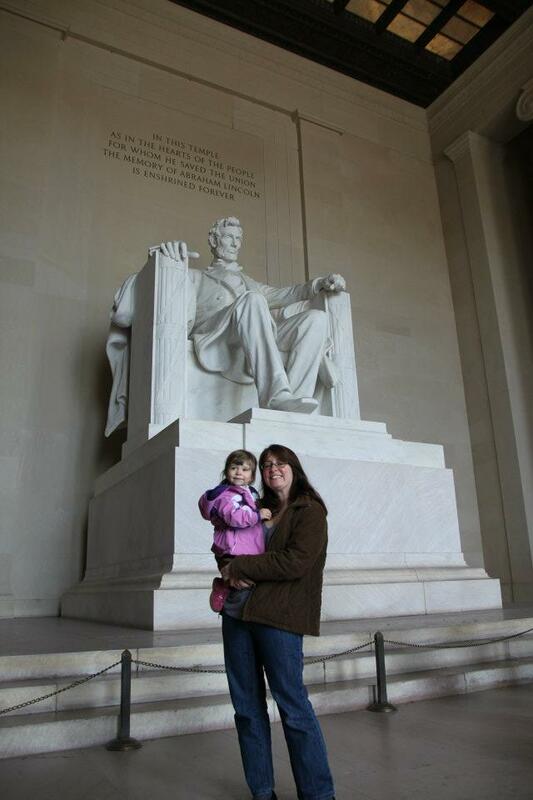 Now, Lincoln is also an inspiration as a bereaved parent. "Since Willie's death, I catch myself every day, involuntarily talking with him, as if he were with me". 2. When I was a child, I would spend summers reading in a hammock and winters curled up on my dad's recliner with a book. It's my favorite hobby. 3. I love where I live. I grew up in western Pennsylvania and I now live in south central PA but even that small move placed me in a different planting zone. When I moved to this part of the state, I immediately fell in love with the town we reside in now. Our neighborhood is perfect for us, with a great mix of people, two of whom I've gotten closer to recently. One of which is probably reading this right now and needs to use this blog challenge to start blogging herself (Hi, Julia!). Our back yard has a beautiful creek running through it with a walking trail along it. 4. I garden, but I am only really inspired to grow things we can eat. 5. My husband took my daughter out for the day today. Being home alone right now seems ridiculously indulgent. 6. My friendships have been either solidified or broken because of what we've gone through this past year. It's a welcomed side effect of the grief. Friends become acquaintances and acquaintances become friends. 7. I have recently thought about making friendship bracelets for those who have really stood by me. I want to make them with clasps so I can take mine on and off (I'll make matching ones for myself and the person I give them to) and I don't even care if the other person wears his/hers. It's just a way for me to feel connected daily to the people in my life who have amazed me with their support. 8. Jewelry has been a huge way for me to deal with my grief. Wearing something that represents V allows me to silently, yet physically carry her with me and put evidence of her out there in a way that people might inquire if interested. E knows which pieces I wear for V and touches them gently while saying, "baby Vi." She got her own "baby Vi" bracelet the other day when our fundraising wristbands arrived! 9. I love asian inspired cooking and sushi. I've started trying to make more of the recipes I love here at home. Sesame noodles have been a weekly meal lately. 10. My favorite blogs are Swistle, Amalah, Mamapundit, and The Spohrs are Multiplying. Leave me a comment with your favorites. 11. I'm trying to figure out Twitter. I don't really like it so far. 12. I love reality tv. The more mindless, the better. 13. My husband is truly my best friend. He is hilarious, smart, resourceful, loving, kind, quirky, totally handsome, and all mine. I don't understand how I got so fortunate when it comes to him. 14. We are currently doing home improvements. We recently converted 2/3 of our finished basement into a play room for E after we replaced the flooring and painted. We got new blinds for the living room. I started this project in the kitchen. Can't stop! 15. I miss my family. I'm glad we are going to see them next weekend. IKEA for the first time EVER? It is epic.